Fact: beer can be good for you – just don't overdo it! Home Beer Fact: beer can be good for you – just don’t overdo it! Fact: beer can be good for you – just don’t overdo it! In Britain, there is nothing many of us love more than a good old refreshing pint down the pub. However, some of us worry that a pint of beer may not be doing our health that much good. Well it appears that beer has been suffering some bad PR on the health front, because when consumed in moderation – i.e. just one or two small beers per day – it can actually have some quite positive effects. Here’s how beer can benefit your health. A medical study found that one daily beer could stop you getting kidney stones. The trial found that, due to the diuretic properties of beer, the chance of getting kidney stones could be slashed by up to 40%. Vitamins B, B2, B6 and B9 are all present in your average pint. Vitamin B6 arrests the build up of homocysteine – molecules that are linked with coronary heart disease. It has been found that beer drinkers have up to 30% more vitamin B6 in their plasma than non drinkers. Another of the vitamins is B9 folate, which, like B6, also impedes homocysteine as well as having anti-cancer properties due to its ability to make and maintain cells. Another of beer’s anti-cancer properties is that it can shield the body from the bacteria helicobacter pylori, which, in addition to being linked to cancer of the stomach, is also linked to stomach ulcers. Triglyceride is a chemical compound that can help to harden the arteries. This in turn can cause strokes or heart disease. One medical trial found that moderate beer consumption lowers triglyceride levels. 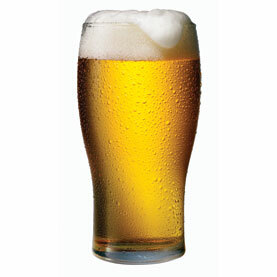 Beers contain the mineral silicon, which helps strengthen bones. India Pale Ales have the highest silicon content and lagers have the least. Polyphenol antioxidants, which are present in beer, act to increase HDL cholesterol levels (good cholesterol). This helps to rid the body of LDL cholesterol (bad cholesterol). Because of these positive cholesterol effects, it’s possible that beer can decrease the chance of heart disease by up to 40%. A pint contains about 20% of your recommended daily fibre intake. Fibre also helps lower LDL cholesterol. Ales contain antioxidants that can help fight off cataracts in older people. Certain darker ales are the most effective. Ethanol – the kind of alcohol used in beer – thins the blood slightly, which helps to stop blood clots forming. Studies found that a daily beer can considerably lessen the risk of developing Type 2 diabetes. Drinking in moderation could reduce high blood pressure. It’s important to reiterate that these health benefits come with just a couple of glasses a day, which should be enjoyed as part of a balanced diet and exercise regime. It’s also important that pub beer lines are maintained in as hygienic a state as possible, as germs can accumulate in poorly maintained lines. The best way to do this is to fit an automatic line cleaning system that can do the job quickly, efficiently and effectively. Companies such as CellarBright can help with this, and it’s a great way to ensure that pints remain as fresh and great tasting as when they left the brewery. CellarBright is a unique automated beer line cleaning system which will save thousands of pounds a year for businesses selling keg and cask beer and lager. It minimises waste by letting the beer that’s in the lines be drawn off and sold before cleaning commences, allowing you to sell 100% of the beer that you’ve paid for. A beer profit calculator on the website shows how much you will save.